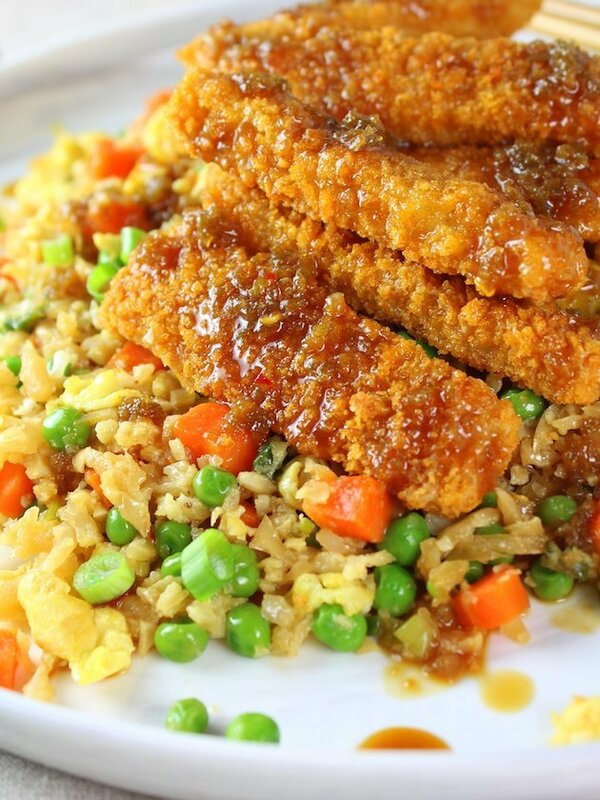 Thanks to our friends at Gorton’s for sponsoring this amazing Soy-Orange Crispy Fish over Cauliflower Fried Rice! 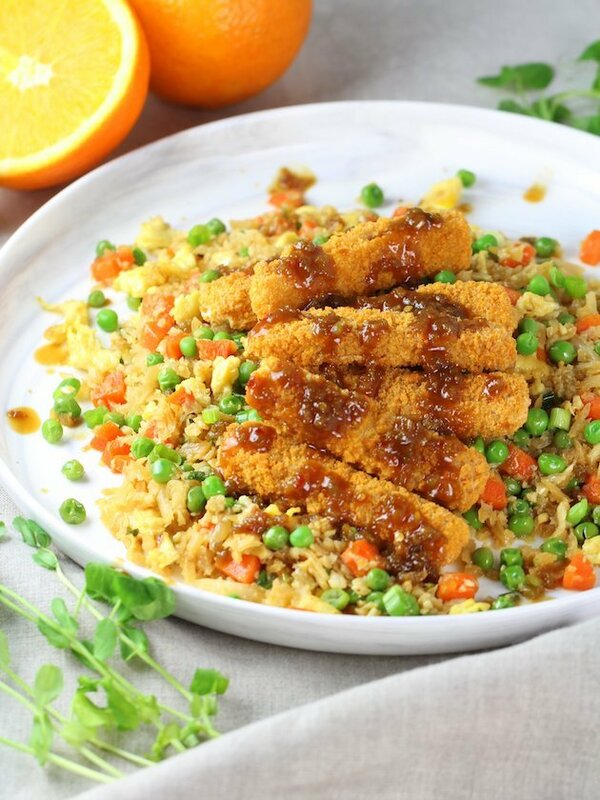 Crunchy low-fat fish served over sautéed grated Chinese-style cauliflower fried rice, drizzled with the most mouth-watering soy-orange sauce. This low-calorie, low-fat meal is sure to be a regular on your weekly meal plan lineup. I’ve got a yummy, healthy, low-calorie, dinner recipe for you today! If you’re on the hunt for some tasty fish recipes for Lent, add this one to your list! I know I’m ticking all kinds of boxes – right!? 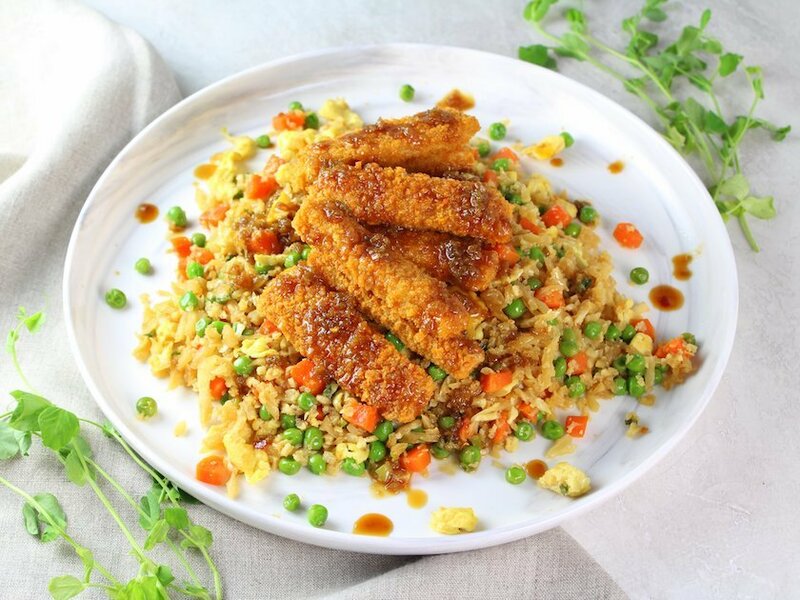 This Soy-Orange Crispy Fish over Cauliflower Fried Rice has it all! The fish I used is from Gorton’s Seafood – 100% wild-caught Alaskan Pollock Smart and Crunchy Fish Sticks. What’s so “smart” about them? 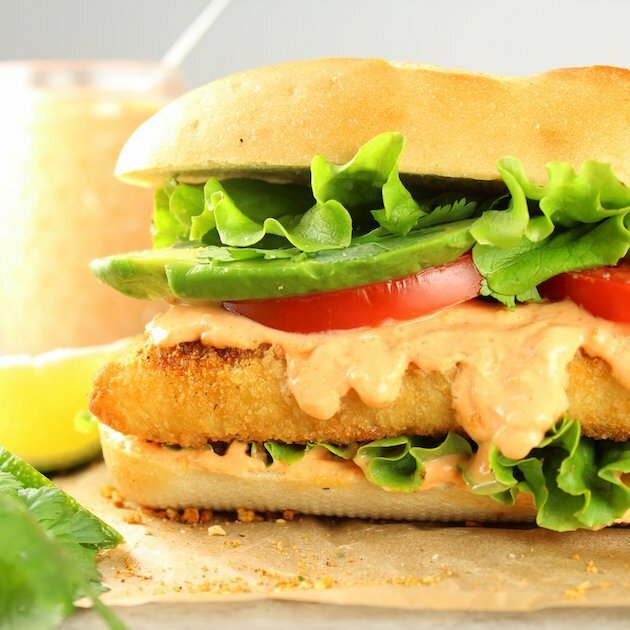 They’re baked with 50 percent less fat than regular fish sticks, they have just 180 calories per serving, and they’re breaded in a panko coating so they’re all kinds of crispy and delicious! Woah!! Somebody pinch me so I know I’m not dreaming!!! 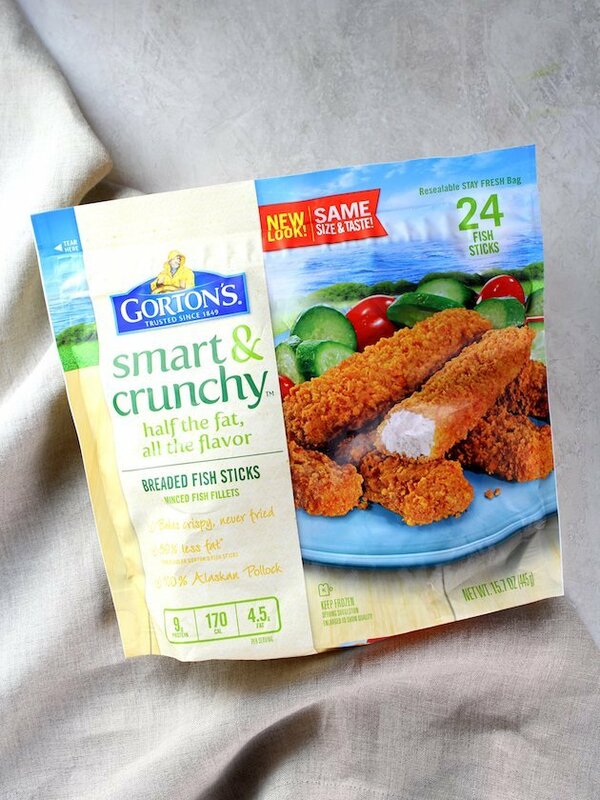 Gorton’s also offers Smart and Crunchy Fish Filets… a slightly bigger portion with only 10 more calories. I know you like your options, so just throwing that little tip out there for free. And just so you know you’re eating seafood you can feel good about: Gorton’s strives to bring the freshest high-quality seafood to consumers while protecting the world’s resources, and they forge long-term partnerships with suppliers that are committed to the same high standards. We like to think of them as seafood experts. After all Gorton’s has been delivering the freshest high-quality fish and shrimp for over 160 years, all the while protecting the world’s resources – now that’s experience you can trust! 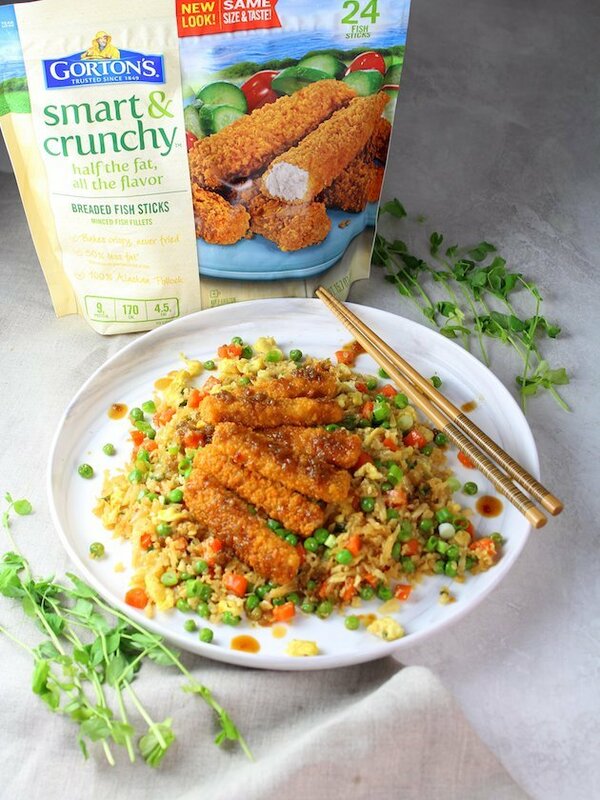 And staying with the theme of keeping it all smart and healthy, we’re serving our crispy fish sticks over cauliflower fried rice today. 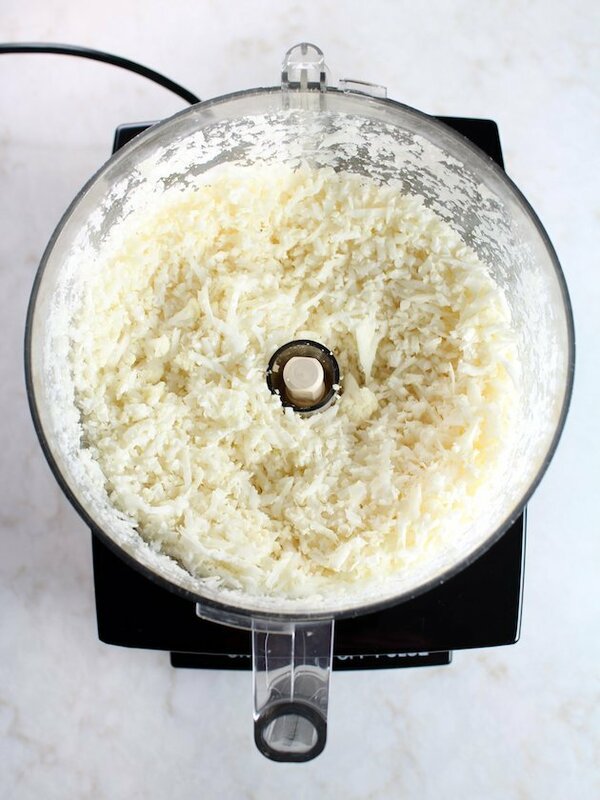 The cauliflower has a really mild flavor so when it’s finely chopped, it mimics rice perfectly. First of all get your oven preheating at 375 degrees, then go to work on the sauce. Because I’m a saucy kind of girl I stirred up a soy-orange glaze for dipping or drizzling or just drinking straight from the bowl (but who would EVER do that – right!??) Ahem. The sauce is super-simple to make and sooo GOOD! You saute the minced garlic in sesame oil for about 1-2 minutes. Then stir in your orange juice, soy sauce , rice vinegar, powdered ginger, (a pinch of hot pepper flakes if you’d like) and corn starch slurry. Let it cook for about 5 minutes until reduced and thickened and set it aside. Friends, I gotta tell ya, this soy-orange sauce is just flat out all kinds of delicious! Now your oven should be preheated so pop in those smart and crunchy fish sticks for about 22 minutes (you’ll want to set a timer so you remember to flip them at 11 minutes). 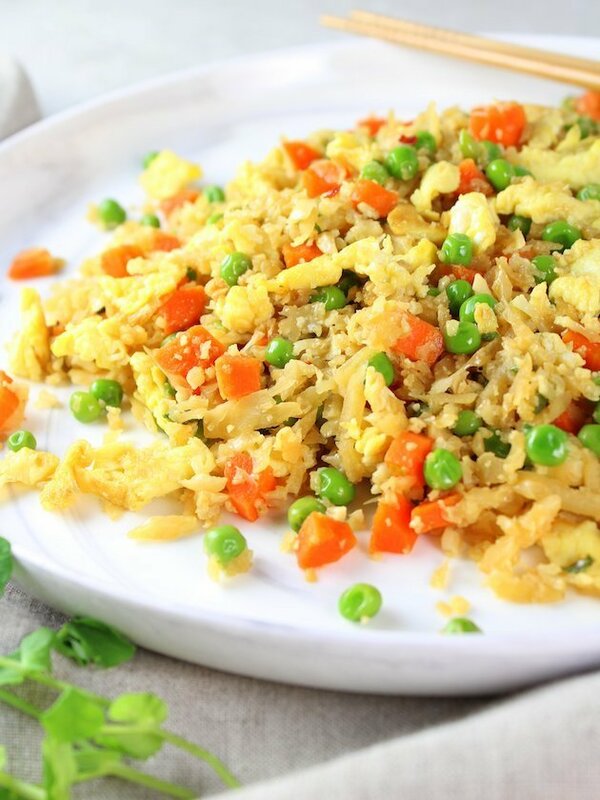 Let’s move onto the cauliflower fried rice…. Scramble 3 eggs in a little sesame oil. Set them aside and wipe the pan clean. Now add more sesame oil and saute some minced garlic for about a minute. 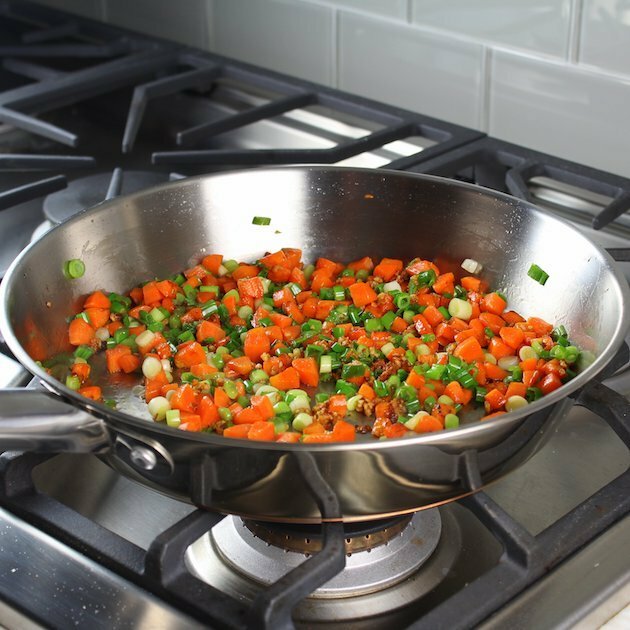 Add finely diced carrots and cook 2-3 more minutes over medium-high heat. Then add in the chopped green onions and powdered ginger, and cook 1 more minute. 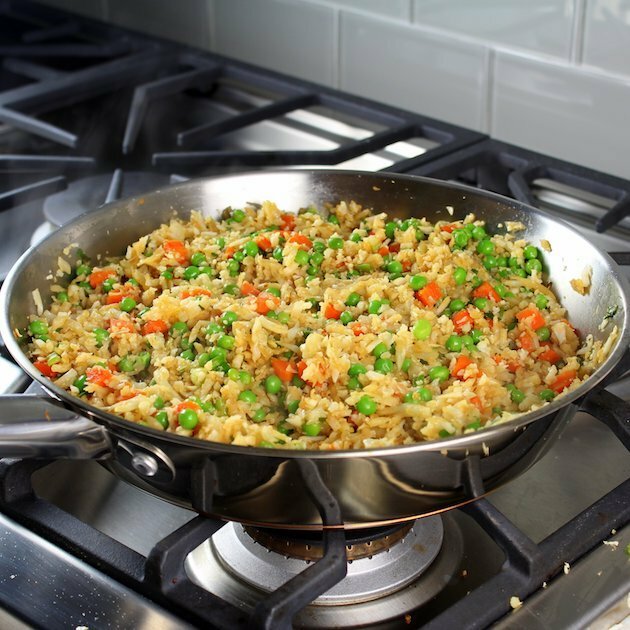 Stir in the cauliflower rice and saute for about 4 minutes, stirring occasionally so that it cooks evenly. Now mix in the defrosted peas and tamari (or soy sauce) and cook for another minute. Lastly, fold the scrambled egg into the mixture. 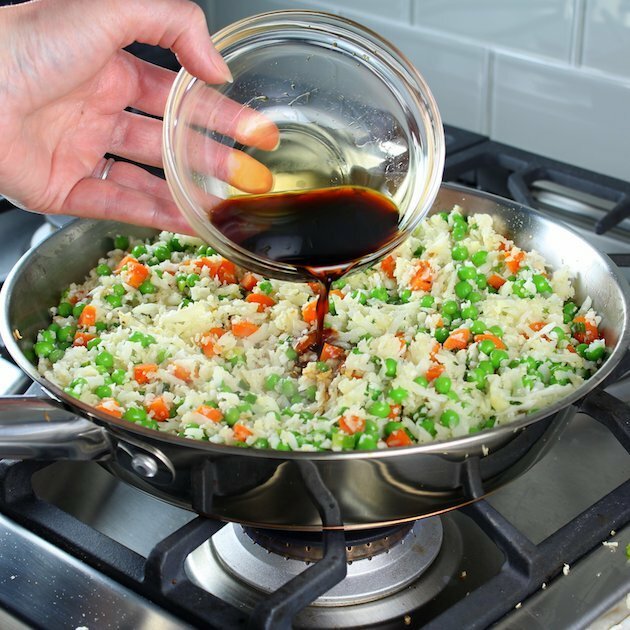 Plate the fried rice, then top with fish and soy-orange sauce. 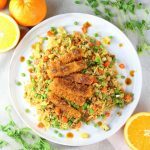 Soy-Orange Crispy Fish over Cauliflower Fried Rice with Gorton’s = an easy and delicious meal you can feel great about serving those you love! 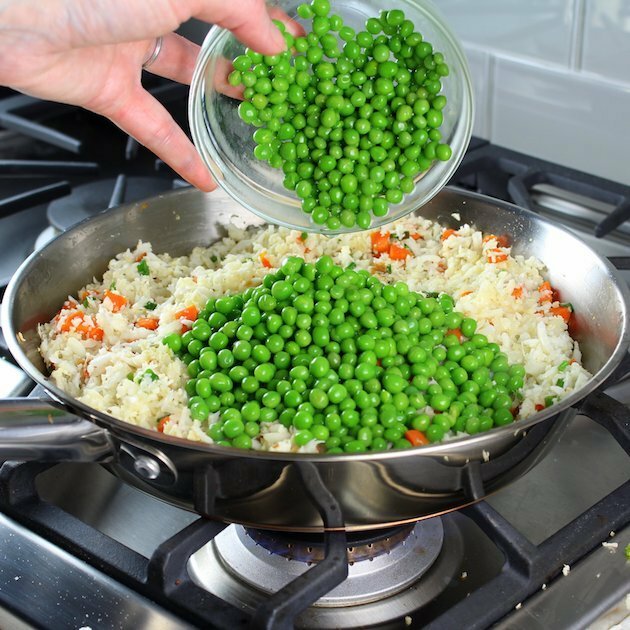 With carrots, baby peas, riced cauliflower, & scrambled eggs. 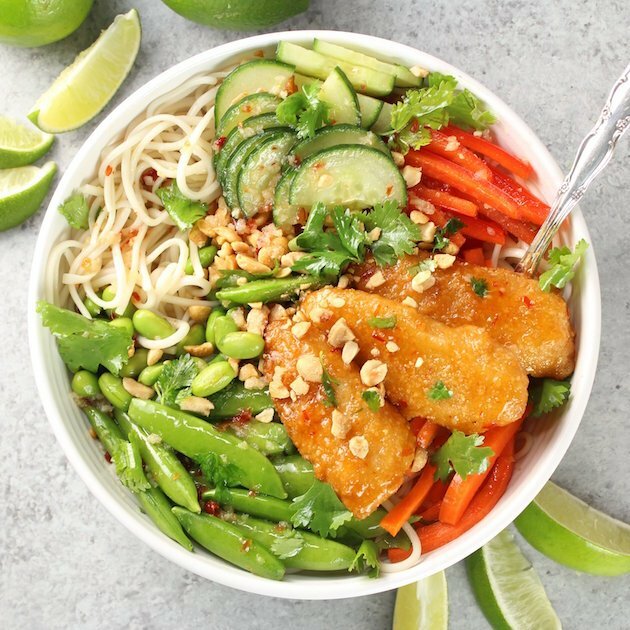 Easy, fast, healthy, and delicious low-calorie take on this classic! In a small pot, saute garlic in sesame oil for 1-2 minutes. Then stir in orange juice, soy/tamari sauce, rice vinegar, honey, ginger powder, hot pepper flakes (if using), and bring to a simmer. In a small bowl, mix the cornstarch with cold water and make a slurry. Whisk the cornstarch into the sauce and simmer for 6-7 minutes until thickened. Preheat oven to 375F, then bake 24 Gorton’s Crunchy and Smart Fish Sticks per instructions (about 22 minutes, flipping once after 11 minutes). 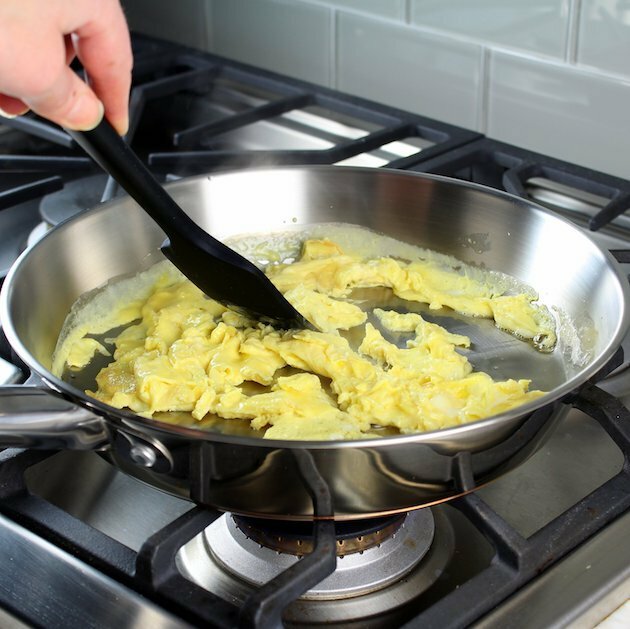 Meanwhile, in a large saute pan heat 1 tablespoon of sesame oil and scramble three eggs. 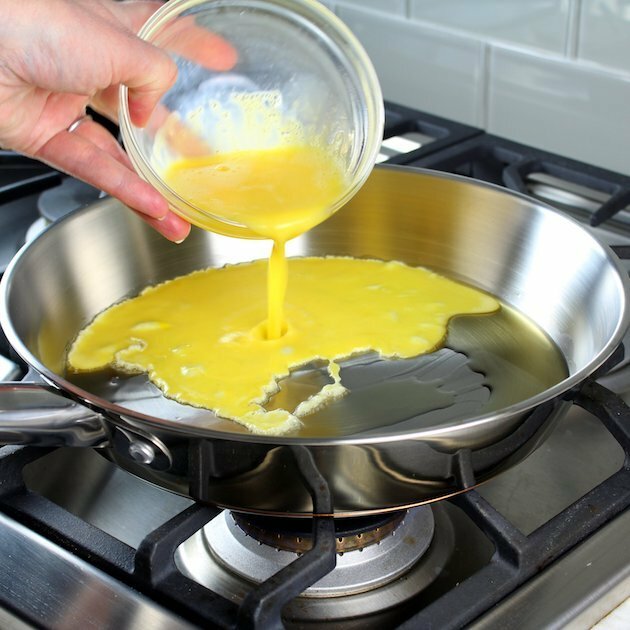 Transfer eggs to a bowl and set aside, then wipe the pan clean. Add two more tablespoons sesame oil to the pan and return to medium-high heat. Add minced garlic and cook for one minute. Add diced carrots and cook 2-3 minutes. Add sliced green onions and powdered ginger and cook for one minute. 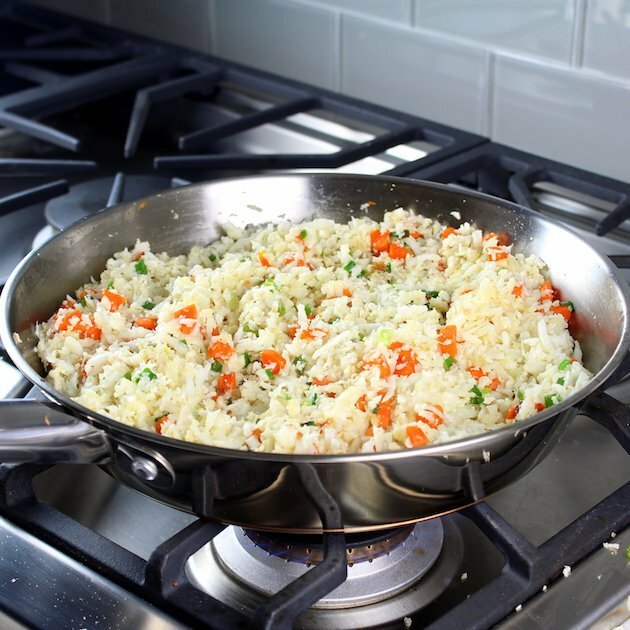 Add riced cauliflower and cook 4 more minutes – stirring occasionally so it cooks evenly. Add soy sauce (or tamari), and peas, then cook for one more minute. 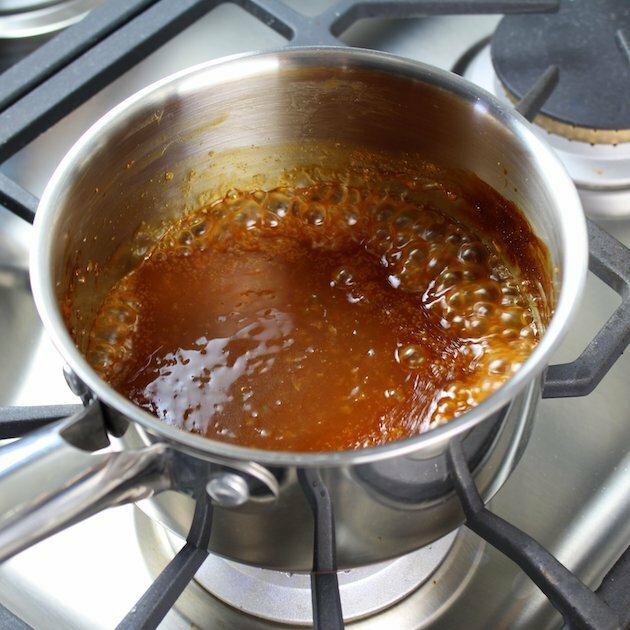 At the same time, put the pot with the soy-orange sauce back on medium-high heat, using a splash of orange juice to thin it if needed. 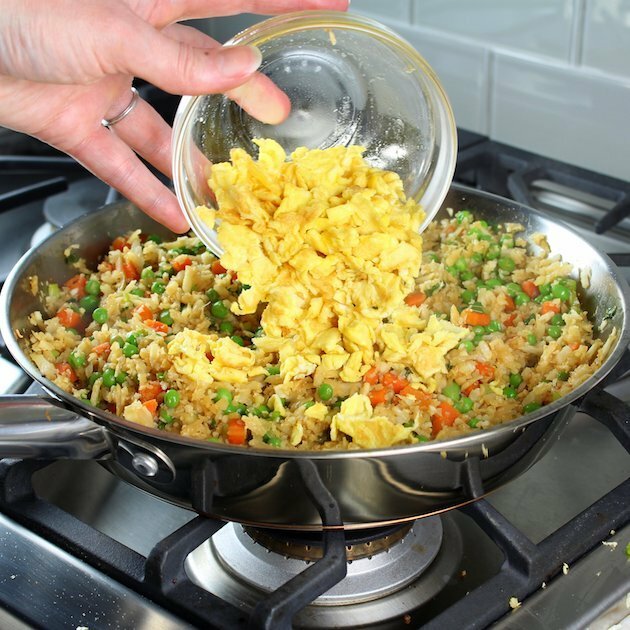 Fold in scrambled egg to the fried rice mixture, and plate the cauliflower fried rice. 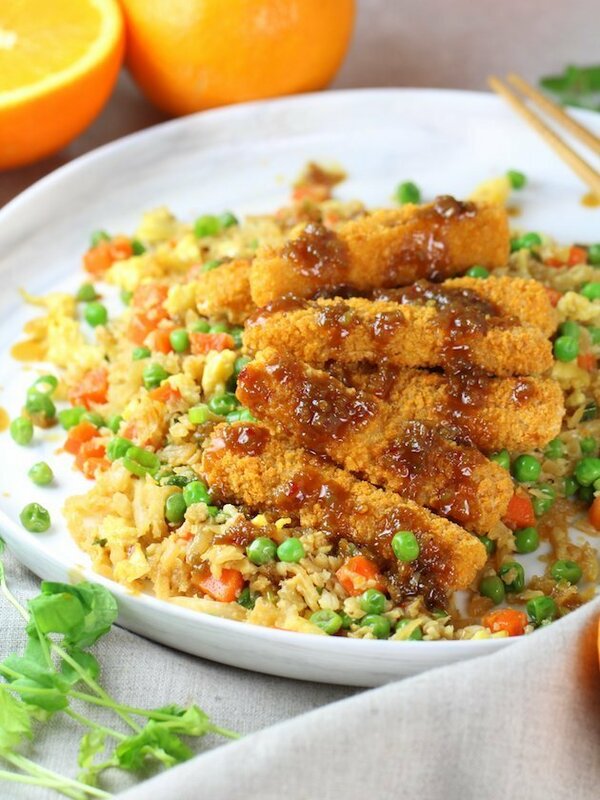 Top each plate with fish sticks and soy-orange sauce, then serve. Looking for more delicious fish recipes? Luckily the kids like fish sticks 🙂 Makes it easy to get some variety in their diet! And who doesn’t love fried rice?!? This recipe looks like a flavorful one! Thanks! Hey Erin, thank you! You gotta love quick and easy semi-homemade meals. It really makes dinner time so much easier. Take care! What a great use of these! Love that cauliflower rice and as always your photos are gorgeous! Thanks so much, Julie! It’s amazing how versatile Gorton’s fish sticks are! Aww, thanks sweet lady! it’s sooo good!